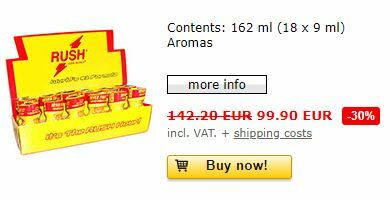 No new ideas here but also a great way to buy your poppers is in bulk. Packs of poppers bundled together to give customers more and everyone kept happy. No secret either that by buying extra both sellers and buyers alike come out winners. Again no great marketing strategy here just simple maths. Just three examples of some of the most popular poppers brand names. In shop we sell daily, weekly, monthly and well have been doing this for decades. Stock comes in and then is not held in shop for long. A quick turn around is good business, a fresher product with more shelf life for all. Check out 18 x 9ml. Other offers include X Trash,Orgasmus and Gold. Of course all deals are subject to change and nearly if not all lines will make it into the hall of fame for a bargain super deal of bargain bundle poppers packs.